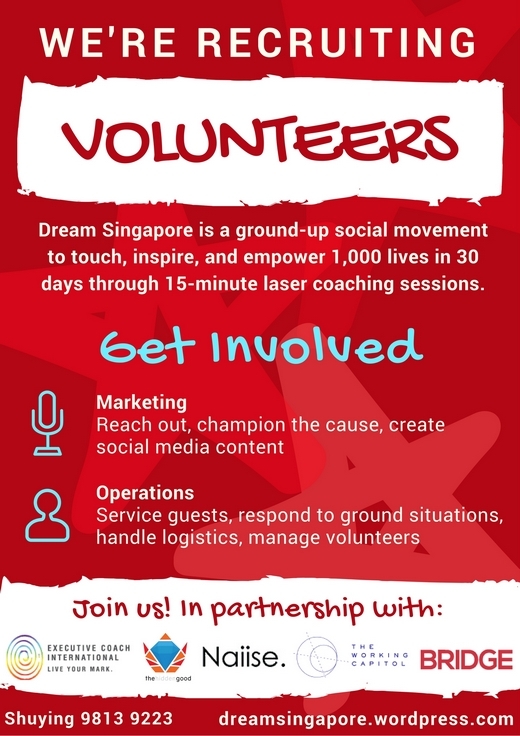 Dream Singapore is a bold social movement to touch, inspire, and empower 1,000 lives in 30 days through 15-minute laser coaching sessions. The vision is to connect Singaporeans to their dreams to unleash their inner creativity and passion, to create a more creative and entrepreneurial society. The movement seeks to effect outer change through inner change. Master Certified Coach Kelvin Lim has coached everyone and anyone, from CEOs, government officials, to youths-at-risk. He now works with MOE, the National Youth Council, and the Singapore Family Courts. He usually charges up to $1,500/hour, and has agreed to make coaching accessible to the public, at no charge. Last year, a bunch of passionate volunteers organised a coaching campaign that touched almost 150 lives. People were inspired, they gained clarity in their lives and career, unleashed energy to persevere in their journeys, and even reconciled troubled marriages. This year, the movement is returning bigger, better, bolder. It has partnered with The Hidden Good, Naiise, The Working Capitol, and Bridge Partnership to bring you Dream Singapore – coaching campaign for a cause. Volunteer to give back to the community and gain exposure running with a team of highly energetic, passionate change-makers in a national level project. If you have leadership aspirations, you can also be trained to lead a small team of volunteers. Sign up to volunteer at http://dreamsingapore.setmore.com/. Visit the website at https://dreamsingapore.wordpress.com/. Email shuying.ke@gmail.com for more information.